Vysočanská is located in an area called Vysočany (as well as Českomoravská and Kolbenova stations), near the Vysočany railway station. 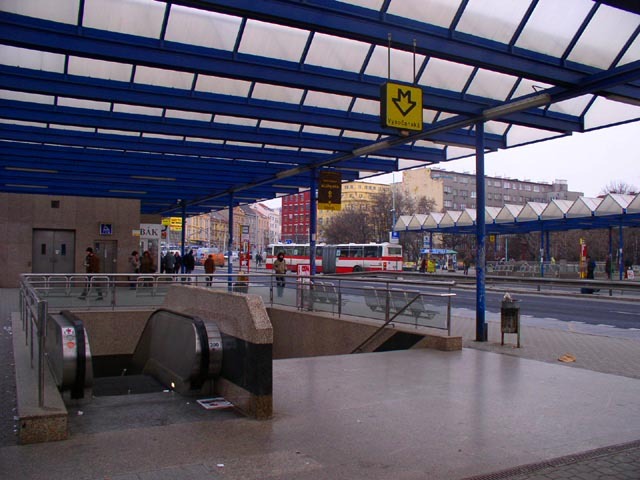 The station was opened in 1998 as a part of the IV.B section, which extended line B to the present terminus at Černý Most. 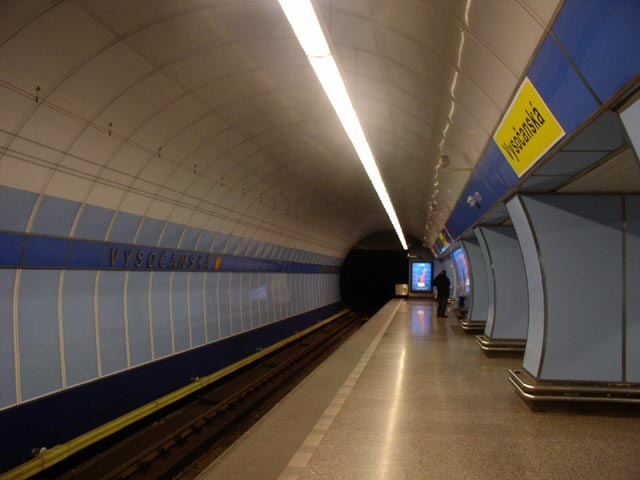 Vysočanská is a bored station with the platform located 31 metres deep. 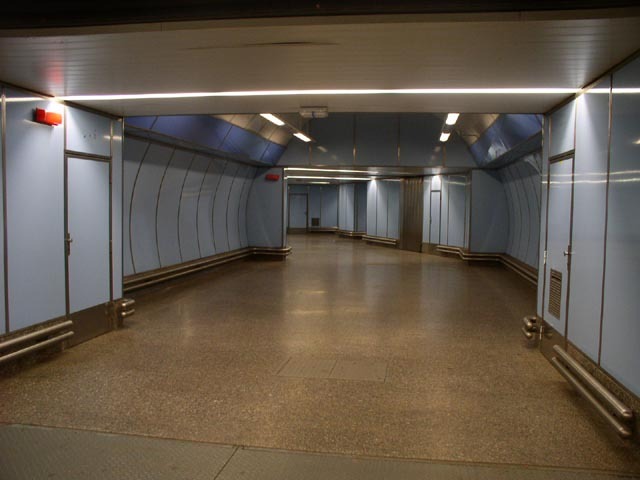 It has two ticket halls, one of them sub-surface and the other surface. 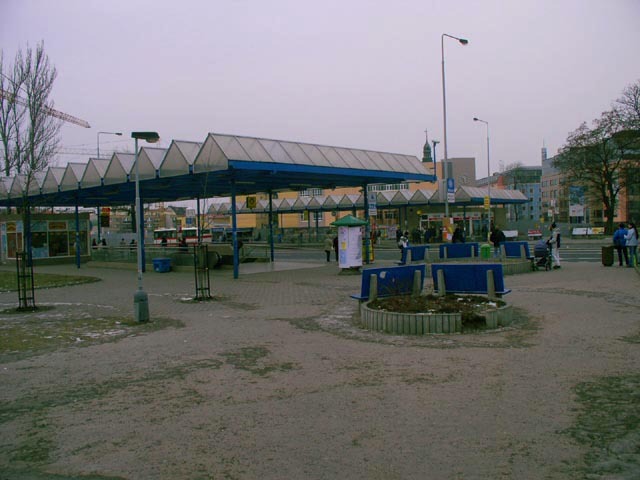 It is also quite important public transport junction: Apart from metro station there is also a tramline and several bus routes going northward and southward from here. 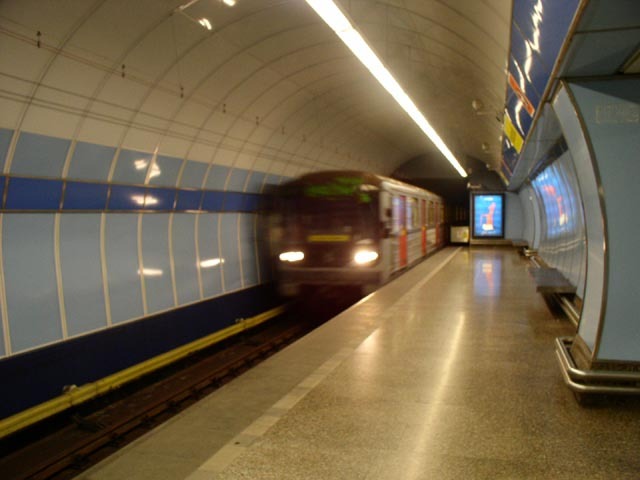 However, the importance of these bus routes will decrease significantly, when the extension of line C from Ládví to Letňany is opened, as metro will cover most of the area today served by these buses today. The area of the west ticket hall of the station. You can see it in front of the yellow house in the middle of the picture. 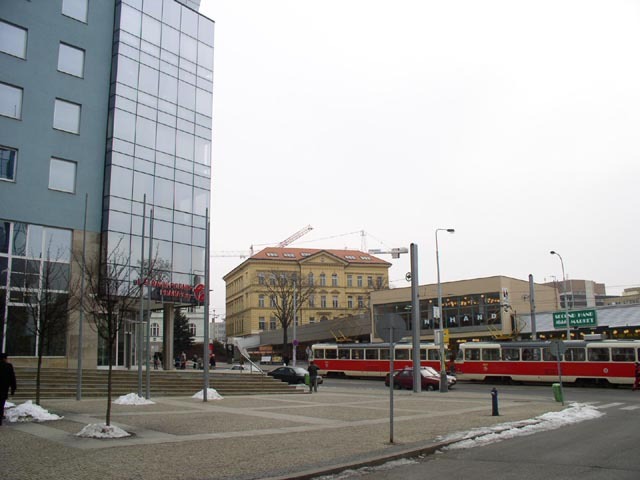 The modern building on the left is a new headquarters of Prague Public Transit Company. 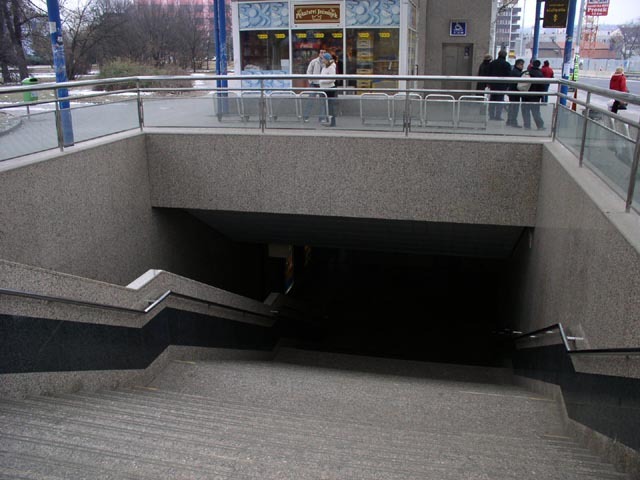 Here you can see the station entrance. This is the surface ticket-hall. New kind of signage inside the west ticket hall. These cylinders in the colour of the line appear at all new and reconstructed stations and they are going to gradually replace some older signage in the whole metro system. 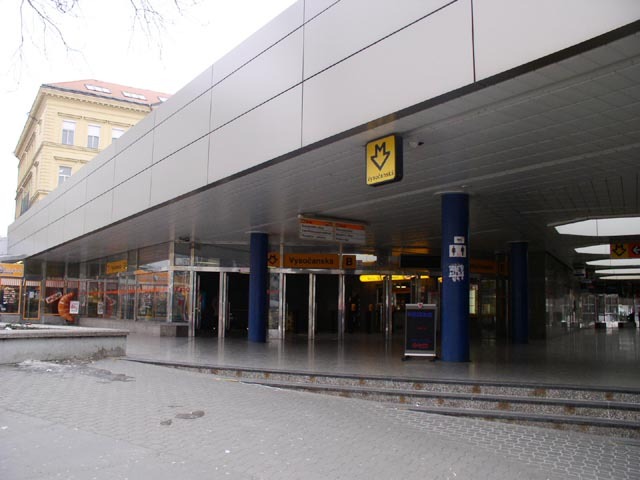 United Nations square with the east ticket hall of Vysočanská station. 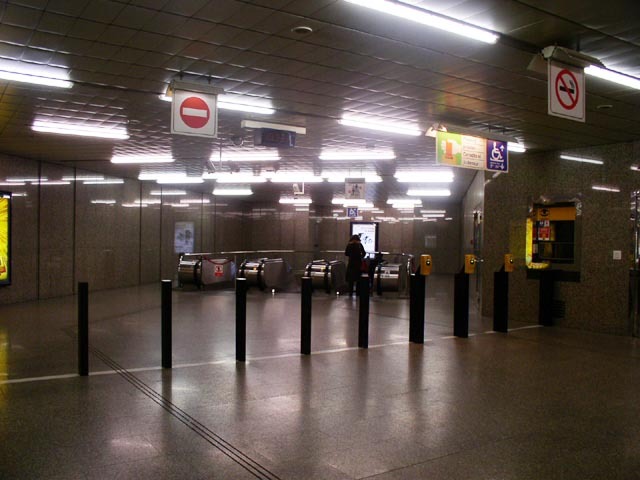 One of two entrances to the east ticket hall. And the other one. They are located on the opposite sides of Freyova street where all the above mentioned bus routes go. So there is one station entrance at the bus stop bor northward buses and one for the southward buses (it's this one). 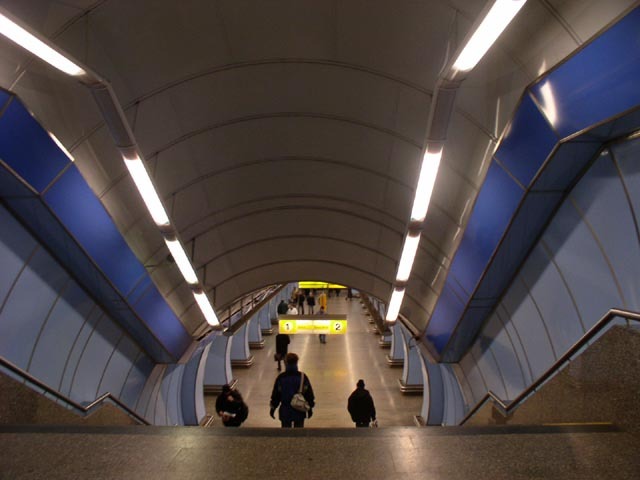 The same station entrance as on the previous image, viewed from below. 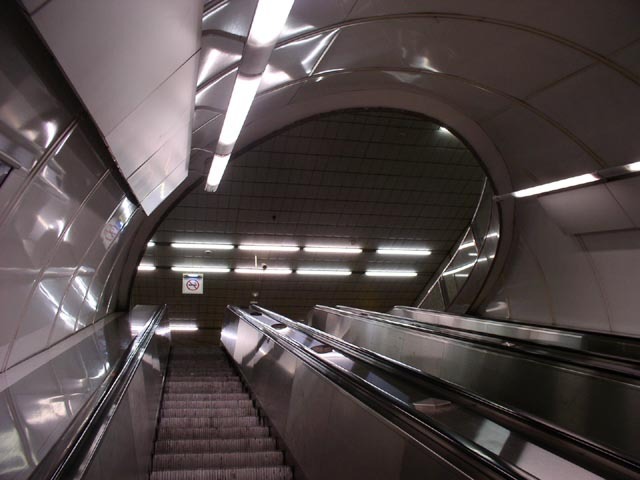 Upper end of the escalator shaft from the east ticket hall to the platform level. A view from the top of the escalators to the bottom. 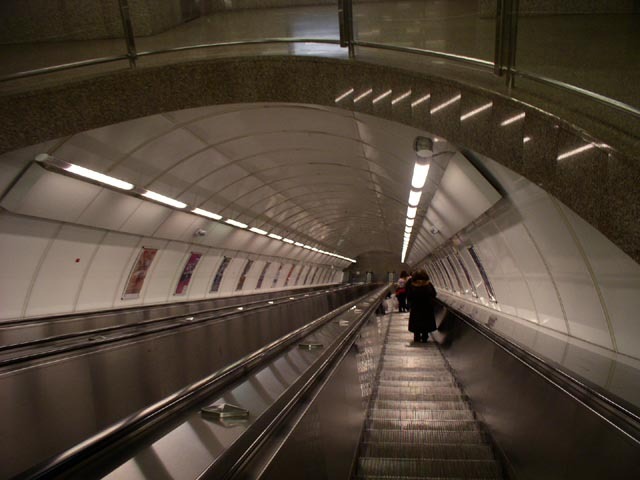 Whereas at most metro stations the escalator shaft goes directly from the ticket hall to the platform level, there are several stations (especially on line B) where it is more complicated. 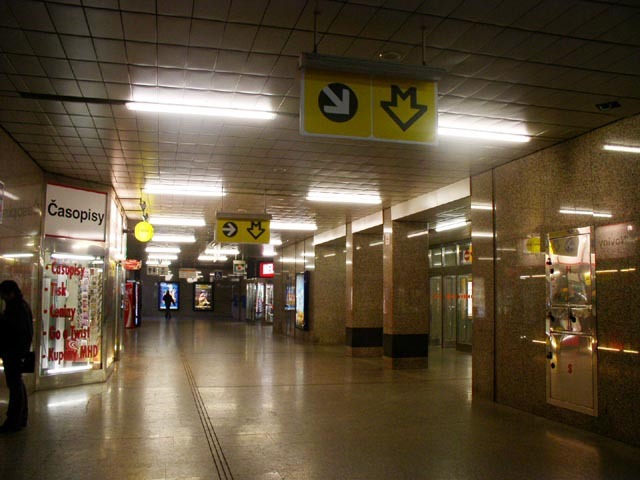 One of them is Vysočanská, where the escalator shaft from the west ticket hall goes to this passageway. 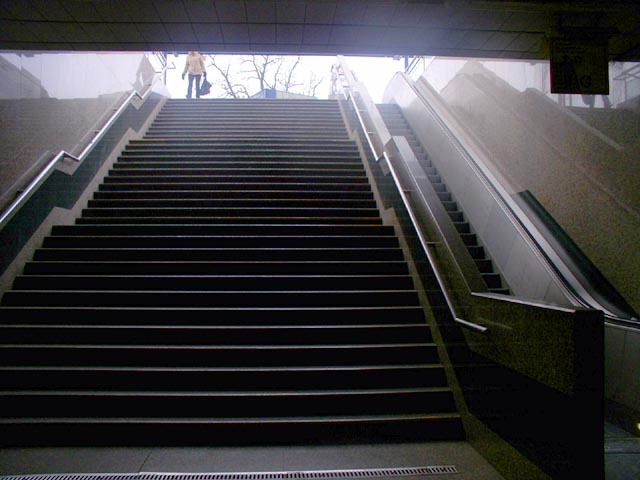 If you go on from the place on the previous photo, you'll get to this stairway, which will lead you to the central aisle. And a train bound for Zličín is arriving from Kolbenova.